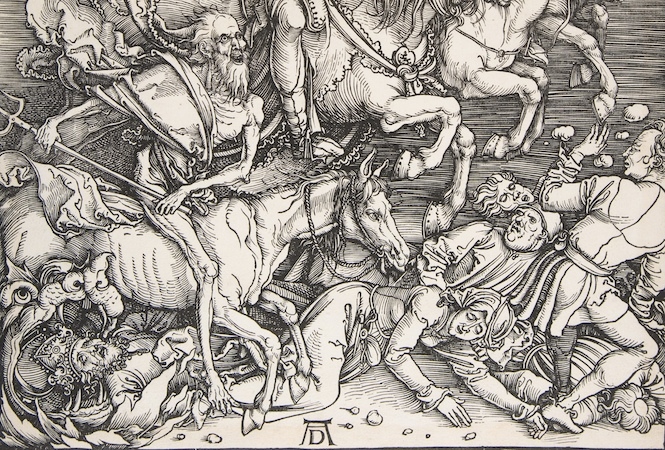 Albrecht Dürer’s woodcut, Four Horsemen of the Apocalypse, always reminds me of my lifelong love of Hollywood cowboy movies. American westerns are almost all predicated on Christian themes, and riddled with simple symbolic numbers. Maybe you are familiar with the 1960 Western The Magnificent Seven and their connection to the Seven Virtues? And in terms of the Seven Vices, in the 2007 remake of 3.10 to Yuma, the ‘villain,’ Ben Wade, is trailed by six members of his outfit who try to free him from his captors—his release would restore their numbers to seven (and need I point out that ten minus three—the 3.10 of the title— is seven?). In the original poster for High Noon, Gary Cooper confronts four villains. 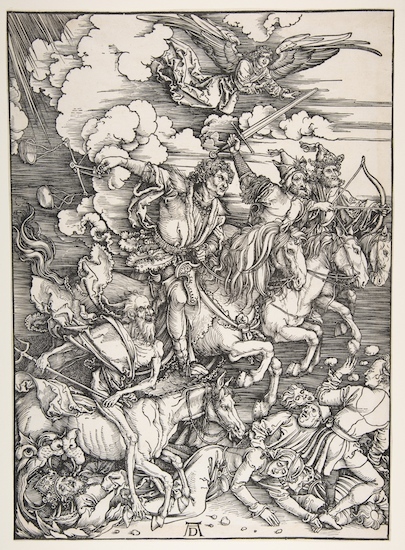 This is why, for me, Durer’s Four Horsemen, drawn from the Book of Revelation (the last book of the New Testament which tells of the end of the world and the coming of the kingdom of God), have always been the sinister apocalyptic cowboys of world-ending destruction; Conquest, War, Pestilence (or Famine) and Death itself. Of course, that’s not at all what Dürer intended. The image was made as one of a series of fifteen illustrations for a 1498 edition of the Apocalypse, a subject of popular interest at the brink of any new millennium. In 1511, after the world had failed to end, the plates were republished and further cemented Dürer’s enduring fame as a print-maker. In the text of Revelation, the main distinguishing feature of the four horses is their color; white for conquest, red for war, black for pestilence and/or famine, and pale (from ‘pallor’) for death (Clint Eastwood, Pale Rider, anyone?). The riders each arrive armed with a rather obvious attribute; conquest with a bow, war with a sword, and a set of balances for pestilence/famine. 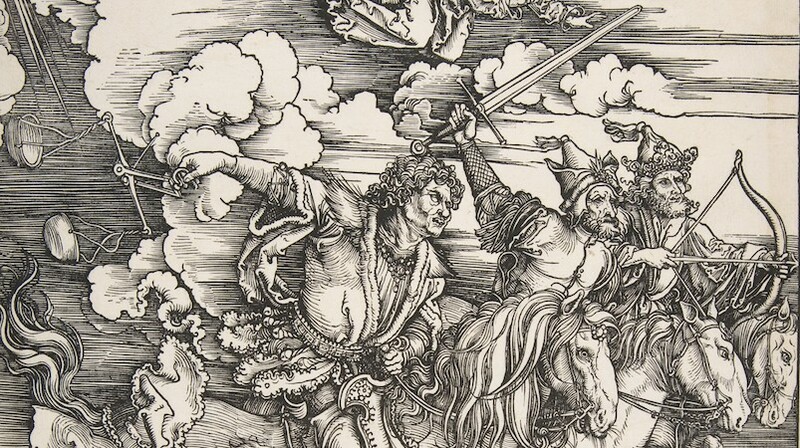 Dürer’s pale rider carries a sort of pitchfork or trident, despite the fact that he’s given no weapon in the Biblical account; he simply unleashes hell. The quality of Dürer’s woodcut is breathtaking; one hears and feels the furor of the clattering hooves and the details, shading and purity of form are astonishing. Dürer’s unique genius as a woodcut artist was his ability to conceive such complex and finely detailed images in the negative—woodcut is a relief process in which one must cut away the substance of the design to preserve the outlines. Before Dürer it was often a rather crude affair. No one could draw woodblocks with the finesse of Dürer (much of the cutting was done by skilled craftsmen following Dürer’s complex outlines). The images are astonishingly detailed and textural, as finely tuned as drawings. So influential was Dürer’s graphic output, in both woodcut and engraving, that his prints became popular models for succeeding generations of painters. He was no mean painter himself, producing a varied and articulate array of self-portraits, as well as religious works, and turning his mind and his hand to the production of an influential book on perspective. He was a humanist, painter, print-maker, theorist and keen observer of nature and is therefore often referred to in popular discourse as the ‘Leonardo of the North’—although his actual output was considerably greater than that Italian Renaissance master. Dürer’s particular genius here is the translation of the distinctive colors of the horses into a black-and-white medium, which he achieves by very distinctly drawing their various weapons and by placing them in order from background to foreground, slightly overlapping, so that they ride across the composition in the same order as they appear in the text. This places the apparition of Death, a skeletal monster on a skeletal horse, in the foreground, trampling the figures in his path. 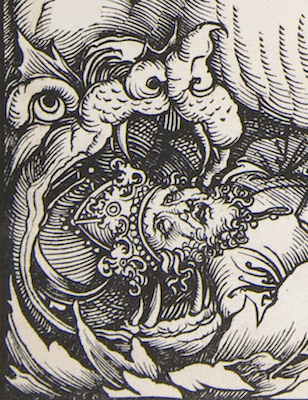 In the wake of Death’s trampling hooves, a monstrous, fanged reptilian creature noshes on the mitre of a Bishop, a prefiguration, perhaps, of the imminence of the Protestant Reformation that would sweep across northern Europe in opposition to the excesses of the church and papacy. Cite this page as: Dr. Sally Hickson, "Albrecht Dürer, The Four Horsemen of the Apocalypse," in Smarthistory, August 9, 2015, accessed April 22, 2019, https://smarthistory.org/albrecht-durer-four-horsemen/.